The wider economic context made 2011 a challenging year for Redwings. Horse neglect and abandonment have increased demand for our services, while many of our donors feel unable to be as generous in their support as they have been in the past. The investments we have made in land over recent years have proved to be wise, reducing the need for rented facilities. But more than anything, our passion for equine welfare has helped us to ride out the storm. We have continued to rescue and bring in horses despite being full, providing expert veterinary treatment, rehabilitation and, in many cases, permanent care. As we are funded entirely by public donations, we depend on the generosity of our supporters to help us provide a better quality of life for our horses. This website contains highlights from our Annual Review. If you would like more information about our activities, you can download any section of the Review as a PDF. 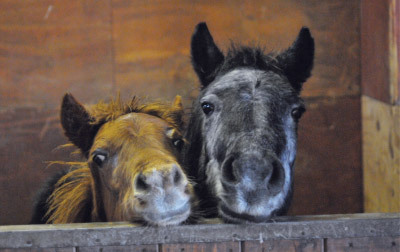 We would like to thank all our friends and supporters, on behalf of all the horses, ponies, donkeys and mules we have helped in 2011. In 2011 we worked all over the UK to rescue horses, support smaller charities, and educate people on how to prevent horses suffering. Numbers alongside counties/areas show how many rescues took place. With the worsening animal welfare situation in the UK, the number of abandoned horses being reported to us has tripled over the last three years. In 2011 alone, our Welfare team brought 170 new arrivals into the care of the Sanctuary. Although we would love to be able to help every horse or pony in need in the UK, we have to take each case on its own merits. We prioritise cases of neglect or cruelty – especially those cases where no other organisation would be able to help. Amigo, who had been left to fend for himself on an old colliery site. To find out more about these cases and others, create your own PDF of the Annual Review or visit the Rescue section on our main site. Our Rehabilitation team, based at a specialist yard in Norfolk, works with some of our most traumatised residents, using techniques developed over many years of working with nervous, unhandled, or aggressive horses. We believe that there is no such thing as a ‘bad’ horse – undesirable behaviours result from how they have been trained or treated. Our rehabilitation yard is set up to cause as little stress as possible to the horses in our care. For example, we use round pens to provide a safe area where we can work with the horses without them being able to trap themselves – or a member of the team – in a corner. Our team works with horses for a short period every day, responding to their body language and gradually earning their trust. The methods used depend on individual cases – these can vary widely, from a gentle deaf pony to four challenging young cobs! Shaun, a tiny pony with a big attitude, now successfully re-homed. For more information about the Rehabilitation team’s work, please visit the Rehabilitation section on our main site. 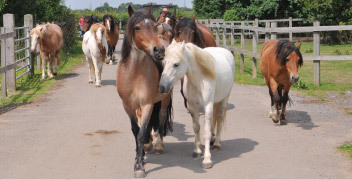 We have nearly 500 horses and ponies living in guardian homes across East Anglia. Some compete at a high level in the show ring or in competition, but most are simply beloved family members. Every horse is visited twice a year by our local Welfare Advisers. Re-homing is intended to be permanent, but we will always bring a horse back to the Sanctuary if there are any doubts about its care or welfare. Pongo, who was rescued from common land with a horrific tethering wound. Less than three years later, he is now competing as a show cob! 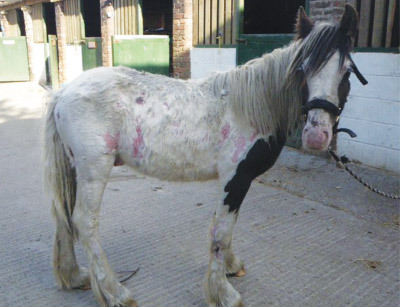 Yogi, who came to us as part of the Amersham rescue – the largest recorded case of equine neglect ever in the UK. Initially very aggressive, after a full rehabilitation programme Yogi eventually found a loving guardian home. For more information about re-homing and our Guardianship Scheme, please visit the Re-homing section on our main site. In 2011 we reached maximum capacity for horses in sanctuary, with over 1200 horses, ponies, donkeys and mules in our direct care. All our horses live outside, as part of a herd, to enable them to demonstrate their natural behaviour and form close bonds with others. This gives them the freedom to exercise, interact and play – and we have found this to be the most effective way of helping them forget any trauma in their past treatment. a specialist team of full-time equine vets and veterinary nurses based at our Horse Hospital in Norfolk, who can provide vet treatments and surgery whenever required. While each of our sites operates on a large scale, we believe every horse is unique and try to reflect this in the care that we provide. It can be quite a challenge at times! Molasses, a rare mule who is the size of a racehorse and a bit of a handful! Boo, the Clydesdale who gets so much out of life despite being completely blind. For more information about our sanctuary care, please visit the Sanctuary section on our main site. try to prevent situations where an owner ends up neglecting the care of their horse. hosted classes and students from equine colleges, schools and local interest groups. Our educational work is complemented by welfare leaflets, a twice-yearly newsletter and ‘Young Redwings’, our magazine for supporters under the age of 16. In recent years we have also placed more emphasis on web-based material and social media, enabling us to communicate directly and instantly with supporters and members of the public. To find out more, create your own PDF of the Annual Review. To access resources for kids and teachers, please visit the Education section on our main site. In 2011 we rebranded and relaunched our community fundraising scheme. We created the Red Start fundraising pack with ideas, advice and useful forms to help everyone get involved. We also launched several new initiatives including Run for Redwings, which saw us enter eight runners into the British 10K in London. a refurbished horse ambulance, kitted out to our specifications, which travels the length and breadth of Britain to reach horses in need of rescue. To find out how you can get involved, please visit the Fundraising section on our main site. From adopters to regular donors, to those who leave a legacy – our supporters are our lifeblood and we could do nothing without them. Thank you very, very much to all our supporters for your help in 2011.